The 2010 Honda Accord Coupe straddles the sporty-or-sensible divide as well as any car in its segment. It's quick and responsive enough to satisfy all but the hard-core enthusiasts, and its rear seat and trunk are large enough that it makes a great daily driver. It is also one of the few cars to offer a manual transmission on all trim levels. My car is a white, Honda Accord, sedan. It has a spoiler and looks sporty. I purchased this 2010 Honda after my 2008 Honda was totaled in an auto accident. I loved the 2008 Honda. It was larger than the 2010 Honda and I purchased it new. It had all the bells and whistles I wanted. I especially liked the heated seats. The 2010 had cloth seats and I made them change seats to leather. However, the seats are not heated and they are very cold in the winter. I have to place a towel on the seats for warmth. But the car is almost nine years old and runs very well. Plus I have had no problems with it and it has only needed regular maintenance visits to Honda service. The only complaints I have had with all three Hondas I have owned is that they are too slow on the take-off from a stopped position. Also, they are noisy on the inside. But they are safe, reliable cars and I would purchase another one. I plan to purchase one more car and it will either be a Honda or Toyota, used but with all the bells and whistles I have ever wanted in a car. And it will be fast and sporty. Love appearance, comfort, gas mileage. Enjoy radio on the steering wheel. I bought my Honda Accord used but it was like buying a brand new car, it has been extremely reliable and is very comfortable. I like the color of both the exterior and the interior. All lights, mirrors, dial buttons, etc. Are arranged conveniently. I really enjoy the radio volume and channel changer on the steering wheel as it is much safer when driving because I do not have to take my eyes off of the road. This car is not too big but also not too small. It's easy to handle but I feel like there is enough car around me to feel protected. The sound system is very good and easy to use. I appreciate knowing when a tire is low or if the oil needs changing. It is economical as far as gas consumption. I also like the remote key for opening doors and especially the trunk. Overall, I really like this car and have received multiple nice comments on it from friends and family member. Overall it is the perfect car for me. White 2010 Honda Accord with great comfort and adequate amenities. For the four years I have owned my car, I have never had any major problems. My car occasionally squeaks when it brake. I also have to add oil more often than other car owners due to the fact that my Honda gets great mileage but "eats" the oil frailly quickly. It is extremely reliable (I have taken at least eight road trips of ten hours or more and it has never had a problem). The seats are very comfortable and the back row has a large amount of space compared to other cars (According to my passengers). The car contains an excellent stereo system but does not contain Bluetooth. However, it does have an auxiliary cord adapt for people to plug their phones in to listen to music or answer phone calls. The car also has many places in which a car charger can be place and also has one USB port in the center console. DEALER WILL INSPECT AND REPLACE ANY LOOSE FRONT DAMPER BRACKET BOLTS OR SPINDLE NUTS ON THE PILOT IF NECESSARY. DEALER WILL INSPECT AND REPLACE THE SPINDLE NUTS ON THE ACCORD V6 IF NECESSARY. 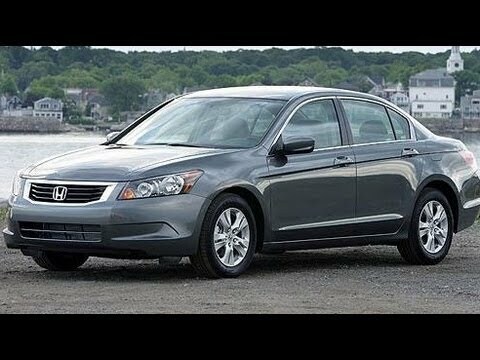 THE SAFETY RECALL IS EXPECTED TO BEGIN ON OR BEFORE DECEMBER 23, 2010. OWNERS MAY CONTACT HONDA AT 1-800-999-1009. IN THE EVENT OF A CRASH, THE FRONT PASSENGER AIRBAG MAY NOT DEPLOY AS INTENDED AND COULD PLACE AN UNBELTED CHILD SEATED IN THE FRONT PASSENGER SEAT AT GREATER RISK OF INJURY SHOULD THE AIRBAG DEPLOY. DEALERS WILL INSPECT AND REPLACE THE PASSENGER AIRBAG MODULE IF NECESSARY FREE OF CHARGE. THE SAFETY RECALL IS EXPECTED TO BEGIN ON OR BEFORE SEPTEMBER 22, 2010. OWNERS MAY CONTACT HONDA AUTOMOBILE CUSTOMER SERVICE AT 1-800-999-1009.